MK Dons' horrid form in October continued on Saturday as they were easily seen off 2-0 by Bristol Rovers at the Memorial Stadium. Picking up just two points this month, Dons have slumped to 16th in League 1, and deservedly left Bristol with nothing to show for their afternoon as once more they failed to create in front of goal. Rovers' opener didn't come until the 65th minute though, as Tom Nichols was gifted the chance to go one-on-one with Lee Nicholls courtesy of a loose Ed Upson header, and duly put the home side ahead. Seven minutes later, Rory Gaffney's excellent performance was rewarded when he beat Nicholls from the edge of the box to wrap it up for the Gas. Illness to Ethan Ebanks-Landell saw George Williams return to the side for the first time since October 7, while Gboly Ariyibi and Aaron Tshibola also came into the starting line-up. Kieran Agard and Ouss Cisse dropped to the bench. 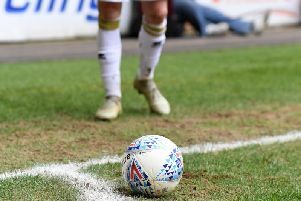 With the sides separated by two points and one position in League 1, it was hardly surprising that the first half was played at loggerheads. Chances were few and far between, and moments of quality were even further apart. Lee Nicholls was the busier of the two keepers as he returned to an old stomping ground, twice denying the home side with good saves to his right, while Adam Smith at the other end only had a deflected Tshibola effort to deal with. The best chance of the half came a minute before the break when Liam Sercombe was put through but Nicholls could only palm it into the path of Rory Gaffney. Joe Walsh though was on hand to swipe his effort off the line. Dons were riding their luck and 10 minutes into the second half had Nicholls to thank again when he tipped Gaffney's powerful header onto the cross bar before it was eventually cleared. Eventually though, their luck would run out but it would be the result of yet another error from a Dons player. Ed Upson didn't see Tom Nichols returning from an offside position as he headed back to his keeper, leaving the Rovers man a simple finish from the edge of the box to give the home side the 65th minute lead. Seven minutes later, they would double their advantage thanks to a fine strike from Gaffney, hitting it low and hard into the bottom corner - no more than the home side deserved. Once again when push came to shove, Dons came out with nothing. Unable to carve a chance, or build a period of sustained pressure, Rovers never looked in trouble. Aneke, having an off day, was struggling to hold the ball up, while Ariyibi's efforts amounted to precious little and he was replaced. But while the substitutes made an impact last week in the 4-4 draw with Oldham, they made none a week later as Dons never looked like scoring or even threatening the Rovers goal in the closing stages to make a fist of it.